If you're a current or potential Soils Alive customer, you might be wondering how Water Restrictions, especially Stage 3 restrictions, may effect our service and fertilization schedule for your landscape. 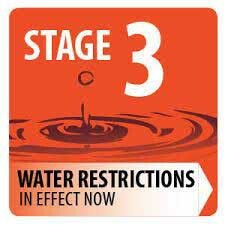 Stage 3 water restrictions are now in place for Collin, Rockwall and Kaufman and parts of other counties, and limit sprinkler use for homes and businesses to once per week. A: We have changed our scheduling to coincide with the new watering days for all those in our northern suburbs affected by the Stage 3 watering restrictions. We will schedule all applications within 3 days of your watering day. Your treatments will occur either on Thursday, Friday or Saturday under these new conditions. Watering within three days of an application is an acceptable time frame based on the fact that our liquid compost applications are a foliar feeding. The fertilizer is taken up through the lawn's foliage. Also, we do not use salt-based dry fertilizers that must be watered in immediately for fear of burning the turf. Our dry fertilizers are broken down by soil microbes and are not water soluble; so technically they don't really need to be watered in at all. Your next application will be a dry fertilizer and should occur sometime in mid- to late-July. The mowing will not affect the treatment either, unless we are on the property at the same time or they are bagging the clippings. So you can rest assured that your Soils Alive treatments will still be safe and effective even if you're under Stage 3 water restrictions. Please don't hesitate to give us a call at 972.272.9211 or CONTACT US online with any questions you may have about water restrictions or our services.